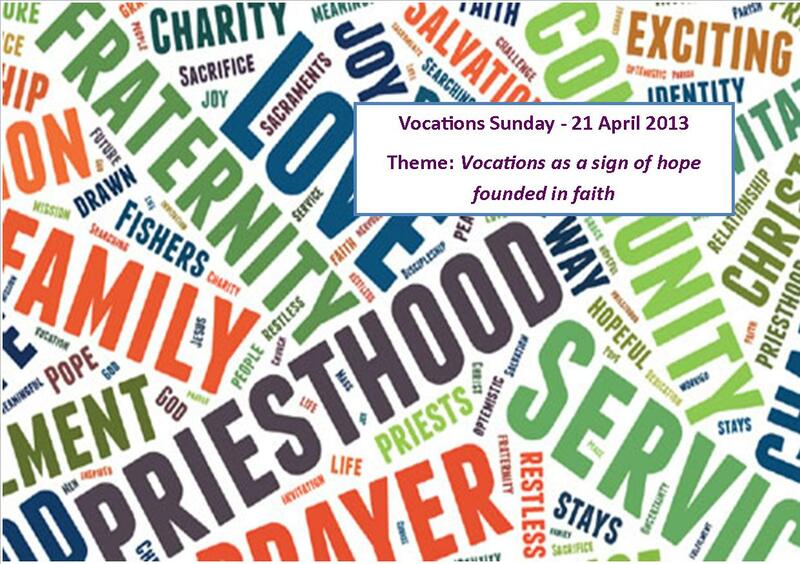 The World Day of Prayer for Vocations or Vocations Sunday as it is more commonly known will be celebrated on Sunday 21 April 2013. The theme chosen for this year is: Vocations as a sign of hope founded in faith. Resources for the celebration of Vocations Sunday will be available here shortly but in the meantime the bishops ask the faithful to continue to pray for vocations to priesthood and religious life and to reflect on this year’s message for Vocations Sunday. Hope is the expectation of something positive in the future, yet at the same time it must sustain our present existence, which is often marked by dissatisfaction and failures. On what is our hope founded? Looking at the history of the people of Israel, recounted in the Old Testament, we see one element that constantly emerges, especially in times of particular difficulty like the time of the Exile, an element found especially in the writings of the prophets, namely remembrance of God’s promises to the Patriarchs: a remembrance that invites us to imitate the exemplary attitude of Abraham, who, as Saint Paul reminds us, “believed, hoping against hope, that he would become ‘the father of many nations,’ according to what was said, ‘Thus shall your descendants be’” (Rom 4:18). One consoling and enlightening truth which emerges from the whole of salvation history, then, is God’s faithfulness to the covenant that he entered into, renewing it whenever man infringed it through infidelity and sin, from the time of the flood (cf. Gen 8:21-22) to that of the Exodus and the journey through the desert (cf. Dt 9:7). That same faithfulness led him to seal the new and eternal covenant with man, through the blood of his Son, who died and rose again for our salvation.